Below are Box Office Collection report of bollywood film Aa Gaya Hero With his review, budget and total box office collection status. Also including of the film. Aa Gaya Hero movie lead star cast is Govinda, Ashutosh Rana. Aa Gaya Hero is an indian Action, Comedy, Drama Film of 2017, directed by Dipankar Senapati & produced by Govinda & Mangal Tara Films. 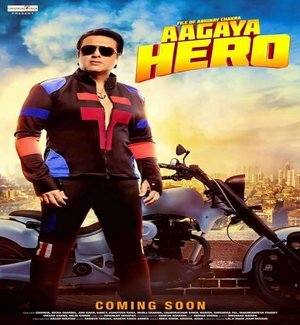 Govinda’s comeback film Aa Gaya Hero will collect in same as yesterday. It was a delayed project and there was no need to the release movie. But Govinda spent 8 crore on P&A and released the film hoping that it will mark his grand comeback. The lifetime Box Office collection will not even reach 1 Cr. But this film did not earn enough to have as much hope as possible from this film. The songs and trailer of this movie were very liked by the people. And we hope this movie will earn well on box office in the coming days. (1) Awesome movie. Full on maja. Gajab ki acting, dance, superb personality. Super hit movie. Blockbuster. (3) I am a Govinda fan.. But seriously. he deserves much better than this. I saw the film and he shouldn't have made that move..The film has nothing to offer.. Nothing.. If u like Govinda.. then watch his other movies..